29-year-old Lachlan Harriot is in a state of disbelief. His ambitious wife Susie, a forensic psychiatrist, has just been found guilty of the murder of serial killer Andrew Gow, who was in her care. In the next two weeks, Lachlan must find grounds for an appeal, or Susie will be given a life sentence, depriving her of her home, her husband, and her two-year-old daughter. Lachlan is convinced of Susie's innocence, and against her express wishes, each night he trudges up the stairs to Susie's sanctum sanctorum-- her study-- where he goes through all her papers. Sitting at the computer, he painstakingly transcribes her case notes, her interviews with Gow and his new wife Donna, and the press clippings from the trial. As he works, he soon finds out that he's raising more questions than he answers, and that the lines between perception and reality, between responsibility and culpability, are blurring. Before I go any further, I need to clarify something. I read the UK edition of this book, which was published as Sanctum in 2003. 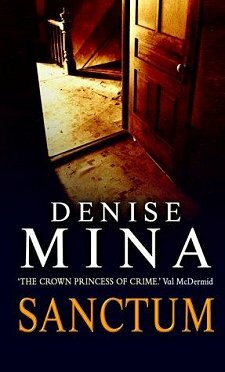 This same book was published in the US as Deception, so if you think you've just discovered a Denise Mina book that you haven't read, be careful! Although the US title is more straightforward, I prefer Sanctum because it's much more evocative of the layers to be found within this book. Mina wrote this book in diary form, beginning and ending with disclaimers that these diaries were found and purchased by her as the highest bidder and as the collector of true crime stories. Make no mistake: every word was written by Mina. Few writers can create such in-depth character studies. And this is exactly what Sanctum is-- a multi-layered, revealing character study told by a young man who's not all that likable but definitely fascinating. As his self-appointed task consumes more and more of his time, he begins piecing small clues together, and he begins to doubt. As he types away at the computer, he wonders if he ever really knew his wife. Just how self-deluding could he have been? Watching the lies and cover-ups unravel to reveal the truth beneath is mesmerizing. If you love a well-developed mystery that unfolds inexorably to its conclusion all the while limning a character that you'll come to know better than you know yourself, Sanctum is a book that you will savor. Cathy - What a fascinating and innovative approach to telling a story! No wonder you got caught up in it. It sounds as though this characters are revealed in slow layers, which is a good match for the storytelling style. I like Mina's writing quite a lot but just hadn't gotten to this. Definitely goes on my TBR. I'll read anything by Mina but this one sounds particularly good. I like the fact that it's a different method of telling the story. That's one of the things I loved about the book, Barbara. I am a Mina fan but missed this one.. I've never read this author and now I feel like I'm really missing out on something. I hate to say this, Ryan, but... you are! Hopefully someone can answer your question, Roger, but I'm afraid that I can't. It's been so long since I read the book that I don't remember the specifics. What do I remember? Lachlan learned that his wife Susie had been deceiving him; then it's learned that Lachlan was deceiving Susie. If I remember correctly, the ending was rather ambiguous so people could come to their own conclusions. If only I remembered my conclusions!